Victor Wiacek came away from a grisly accident with some new attitudes. Call it luck, call it fate, or if you’re Babson ski racer Victor Wiacek, call it serendipity. On Feb. 3, while making his first run on the giant slalom course at West Mountain in Queensbury, N.Y., during an Eastern Collegiate Ski Conference race, Wiacek took a scary fall, and one of his skis came loose, causing a severe laceration and severing arteries in his upper leg. But when Wiacek slid, he happened to stop a few yards from Kurt Mackie, the father of his longtime friend Kylie Mackie, a Castleton University ski racer. Along with Castleton teammate Linn Ljungemo, Kylie Mackie was a gatekeeper at the event, and thanks to their combined efforts, the trio was able to contain the bleeding long enough for ski patrol to rush Wiacek off the mountain and down to nearby Saratoga Hospital. They effectively saved his life. “It was serendipity at its finest,” said Wiacek, who was discharged from Albany Medical Center last week and plans to return to Babson in a few days. “It made me reconsider the way I think about things. I didn’t used to believe in luck, or fate, but I was very fortunate. 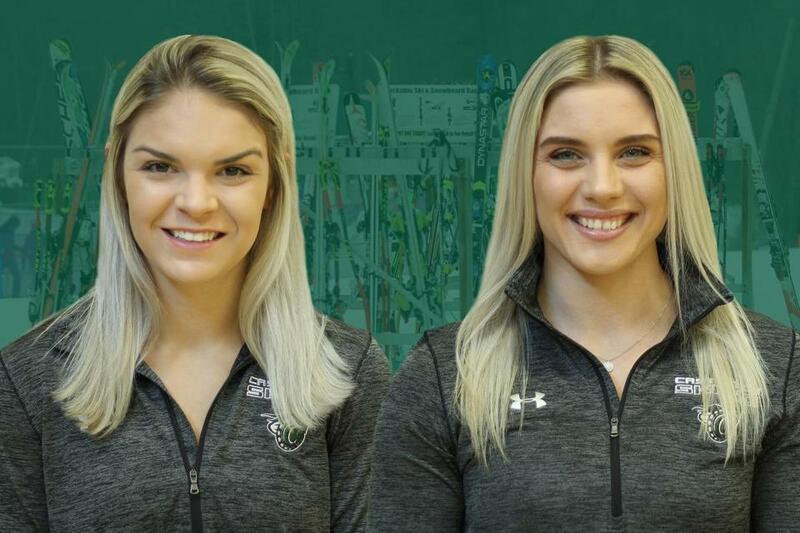 Castleton University skiers Kylie Mackie (left) and Linn Ljungemo. Wiacek, of Douglaston, N.Y., met Kylie Mackie when he was 7 years old and competing on his first ski team at Windham Mountain in New York’s Catskills region. The two became fast friends. When they saw Wiacek fall, Mackie and Ljungemo rushed up the hill, and Mackie used her windbreaker as a tourniquet to stop the bleeding. After spending several days in Douglaston, Wiacek took a trip north Thursday to watch some of his family members ski at his old stomping grounds, Windham Mountain. The Babson student has been far from idle on his road to recovery. He is endeavoring to design a cut-proof racing suit that is both effective and affordable, a product that he says doesn’t exist on the market. Wiacek has been working late through the night with manufacturers in China. Wiacek also plans to move forward by strengthening his relationships with those closest to him. “We’ve already become closer than we ever have been,” said Mackie. “We keep saying that no one can be as close of friends as we are now, because no one has experienced what we did.